Owner and Founder of Fresh Thymes Eatery, Christine Ruch, is no stranger to the food industry. She’s spent more than a quarter of a century working with food and restaurants, but personally, her experience of living with Celiac Disease and Multiple Sclerosis drove her to create real, nourishing food that tastes good but also supports your health. 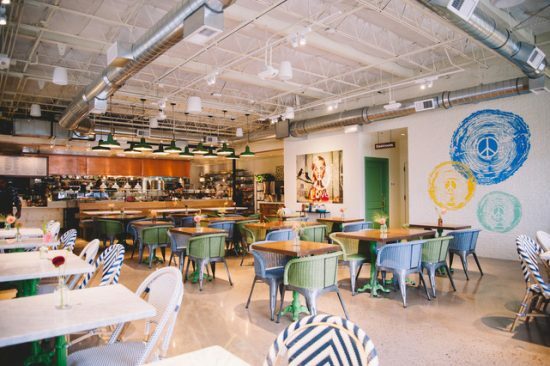 Her restaurant Fresh Thymes Eatery has been supporting those with similar health stories since 2013, and she’s now expanded to offer another extension of the Fresh Thymes brand with her Marketplace. For me, given my recent health journey, Fresh Thymes has been a welcome respite. You can see that as I’ve also covered Fresh Thymes elusive bone broth bar, and when they first opened in 2013 I excitedly covered them during opening week. That said, I was intrigued when Fresh Thymes Marketplace quietly opened three years ago. Admittedly, I thought it was located where the restaurant was for a while, but it’s a new storefront just down the road from their restaurant, tucked away on 28th Street. The Marketplace like the restaurant, is 100% gluten-free. 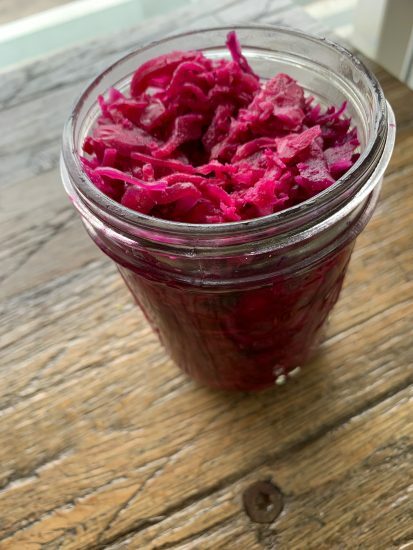 It’s a wonderful retail storefront that offers a wide array of options like gluten-free baked goods, fermenting foods, specialty prepared meals to-go, bone broth bar, custom made nut milks, small batch provisions, and cooking classes. The Marketplace also offers catering options – I’ve used them for my engagement party and wedding shower and featured their delectable and creative desserts. 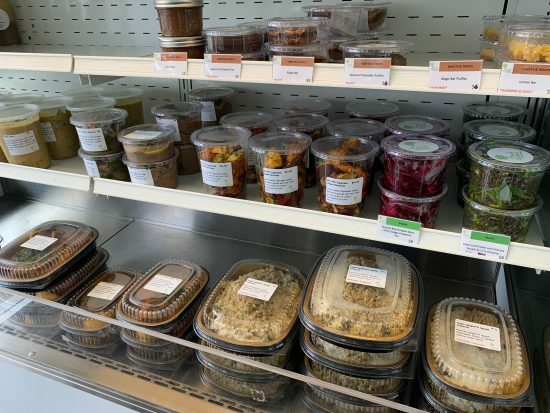 PREPARED FAMILY MEALS find the likes of their: Signature Mac Attack with cashew cream sauce (vegan or with pesto chicken), Pork enchiladas, Signature meatloaf, Spaghetti squash casserole with dairy-free cream sauce (vegan or with bolognese) and more each day! At any given time the Marketplace has out 10 unique gluten-free desserts on display. 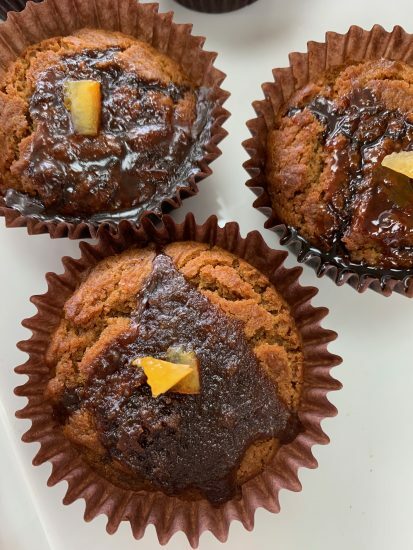 They love coming up with concoctions that support their various customers from sugar free, to Paleo, to egg-free, to nut-free – they care about catering to those that never really could have desserts but now they can enjoy them. Amongst the most popular are their magic bar filled with coconut and caramel and their cheesecake. I love their Mexican wedding cookies which are vegan and gluten-free made with just pecans, almond flour, salt, baking soda, coconut oil, and honey. The best part is no one knows they’re vegan and gluten-free, a true marker of good is good. They even take Kim & Jake’s gluten-free dough and make baguettes to sell which is a nice local partnership touch. The retail side of the Marketplace has really unique curated items Christine picked herself, most of which, I haven’t seen at any stores around town. 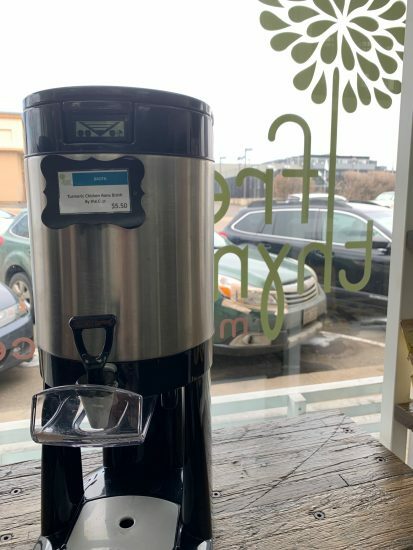 The bone broth bar looks like a coffee bar, except you can choose beef or chicken or do as Christine suggests the ‘arnold palmer’ style combo which is half of each, then take it in your cup for on-the-go sustenance. For their bakery they hope someday in the future to have an order form where you can custom request desserts based on ingredients you can have (think allergens, etc.) for holidays or birthday parties. They started a farm! They have their first seedlings in a green house at Buckner Family Ranch in Longmont. Christine wants to curate specific, custom ingredients she wants but has trouble getting from her regular farm partners in larger quantities such as fennel. Their spring cooking classes have seen quite a bit of success. These are unique classes you wouldn’t see at the likes of a Sur la Table. 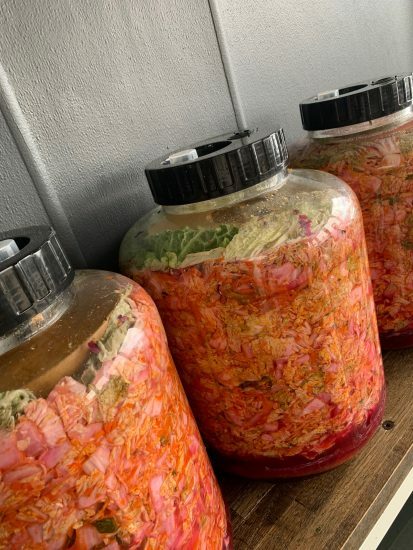 Think: “building flavor with bone broth,” or “nourishing ingredients for optimal gut health” which really help drive home her mission of healing through food. She plans to expand her classes in the fall which you can keep an eye out for here. Note: there are still a few spots left for her April classes! Finally, they’re creating their own blended wines in coordination with Sutcliffe Vineyards out of Cortez, CO. Christine and her team are working on an all natural wine made and blended exclusively for Fresh Thymes. Some will be available on tap at her restaurant and some by the bottle. They aim to coincide the release of the wine for their six-year anniversary this August. 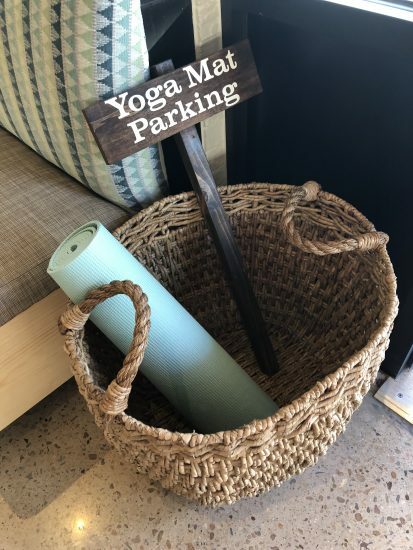 In closing, perhaps the biggest takeaway I have from spending time at Fresh Thymes Marketplace is this: Christine has created such a sincere community – from her 45 staff members she employs between both locations – to the customers that she heals through food and serves daily. There’s a genuine feeling of warmth and care that Christine and her team exude that I think we could all use a little more of in our lives! Anyone that claims to have “super heady” tacos is a winner in my book. McDevitt Taco Supply started as a food stand six years ago on Boulder’s Pearl Street mall. 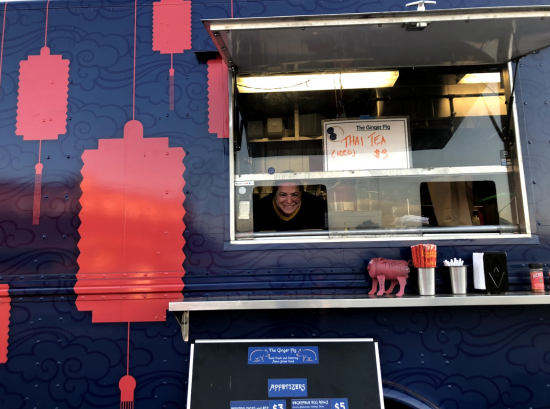 Owner Bradford McDevitt found success on Pearl Street so he expanded to offering a second taco truck at Sanitas Brewing, and created a taco trailer he brings around to music festivals. 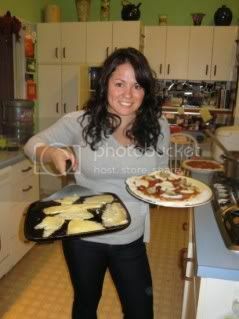 They have a strong catering business now for events and parties, as well. 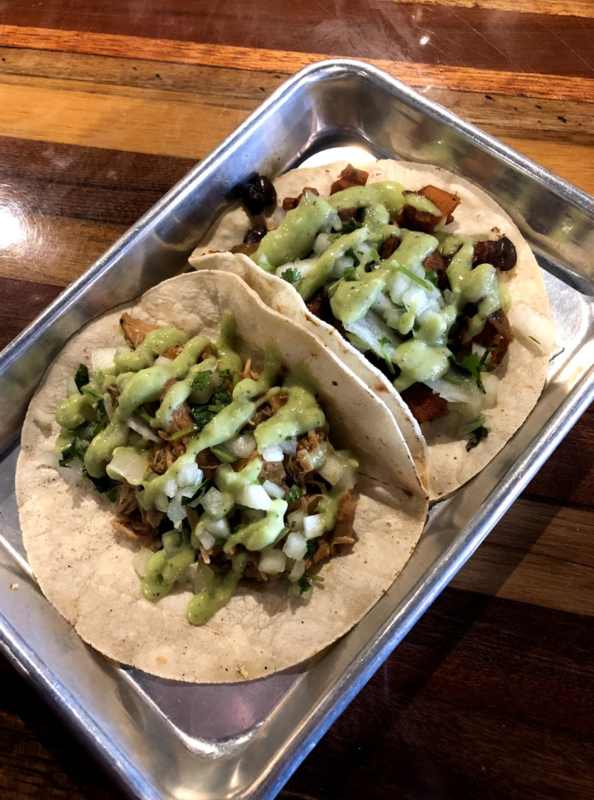 A year go McDevitt opened his first brick-and-mortar location in South Boulder at 4800 Baseline Road – his third location for Boulderites to find his tacos. 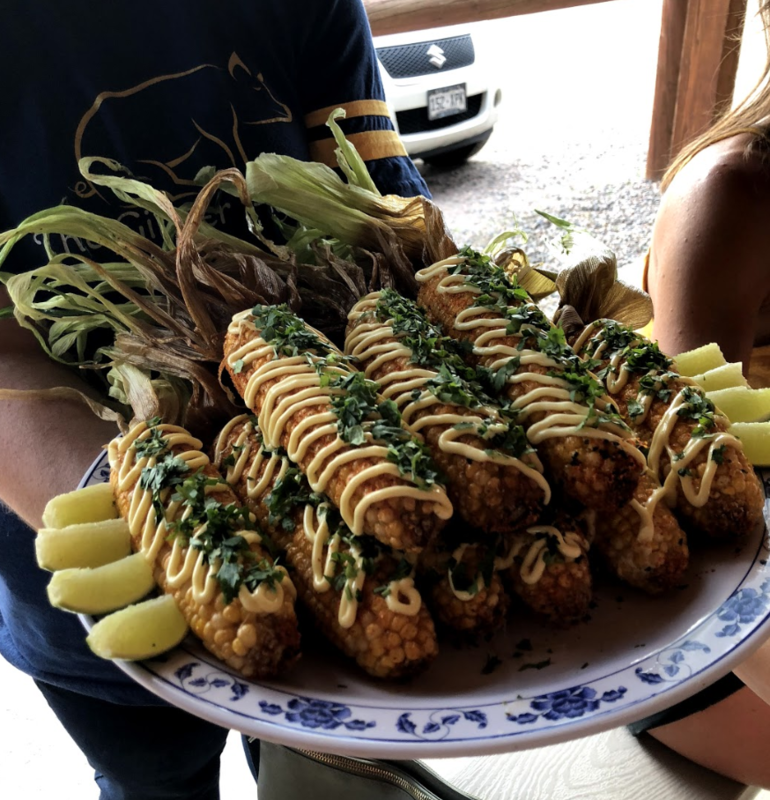 The restaurant boasts a full bar and offers all the well-loved tacos they’ve been serving for years, in addition to a plethora of apps and small plates like Mexican street corn, queso and chips, BBQ chicken quesadillas, and fire roasted sweet peppers to name a few. There are 13 tacos on the menu – all of which are served on gluten-free, local corn tortillas. The tacos themselves are not street style as they’re larger in size. Prices range from $3.5 to $4.75 per. Most of their tacos come topped with cilantro, onion, and their avocado-tomatillo salsa. They serve the traditional standbys like tacos al pastor but they also serve interesting mashups like the cactus taco, honey chili shrimp taco, or the veggie Kale Yeah! that comes with kale, corn, black beans, and green peppers. Everything is made in house besides the local tortillas and there’s great attention to detail for their ingredients which include a wide range of offerings for everyone. I appreciate the great variety. Some standouts include their housemade hot sauces which you should definitely ask for no matter what you eat there, each in their own squeeze bottle: roasted tomatillo chipotle, fermented fresno chile (like a sriracha), and pineapple habanero. McDevitt has local Tequila company Suerte lined up in his bar as he serves their Blanco tequila in his house margaritas and he serves Colorado beers on their six-tap line. In South Boulder, there aren’t many restaurant / bars so it fills a great need for the area. 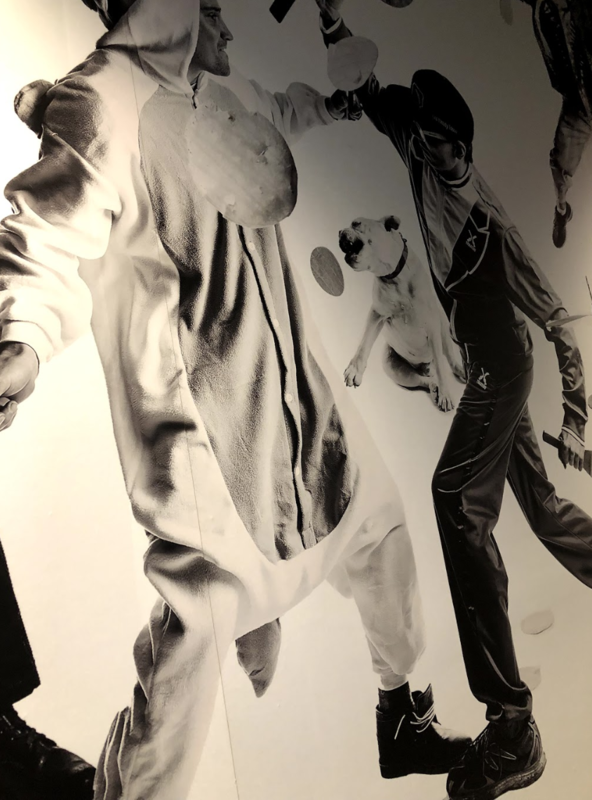 One of my favorite parts about the space itself on Baseline is the lifesize photo of McDevitt and his crew in a real-life tortilla ‘fight’. It’s larger than life (literally) and evokes the fun energy of McDevitt and is such a conversation starter. 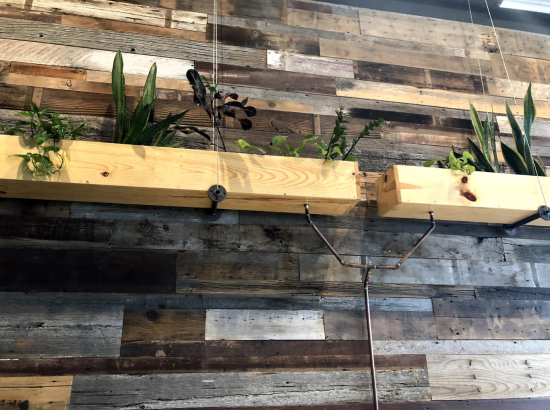 The other wall in the small space is made from reclaimed wood from a local artisan in Loveland, filled with hanging box plants. One more thing you should know: go for happy hour – it’s daily from 3-6 p.m. The food is is at a great price ranging from $2.5-$4 and you could get the house marg for $5 or a local beer for $3.5. Great deal. McDevitt Taco Supply is open daily for lunch and dinner starting at 11:30 a.m. Find them at 4800 Baseline, Suite C110. For a town like Boulder, it often surprises me there aren’t more health-conscious eateries. I’m glad to share that Flower Child just opened their first Colorado outpost in Boulder at 2580 Arapahoe Avenue. 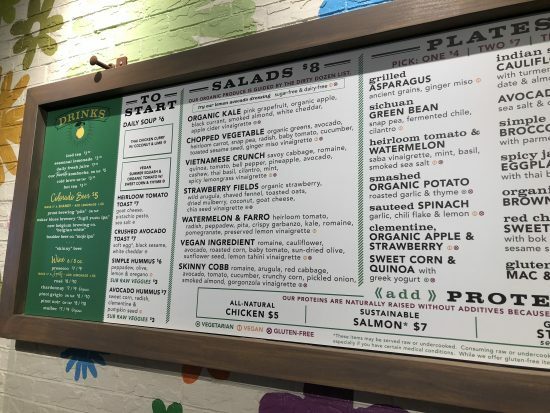 The healthy, fast-casual restaurant serves made-to-order food that’s nutritious and accommodating with options for vegans, gluten-free, and vegetarian (well marked on the menu). I was surprised to learn across all their locations, each one sources locally which is no small feat. The menu has salads, hummus and soup specials, plates, bowls, whole grain wraps, and even a kids menu. They do have meat options from all-natural chicken, sustainable salmon, grass-fed steak, and organic non-GMO tofu as add-ons. 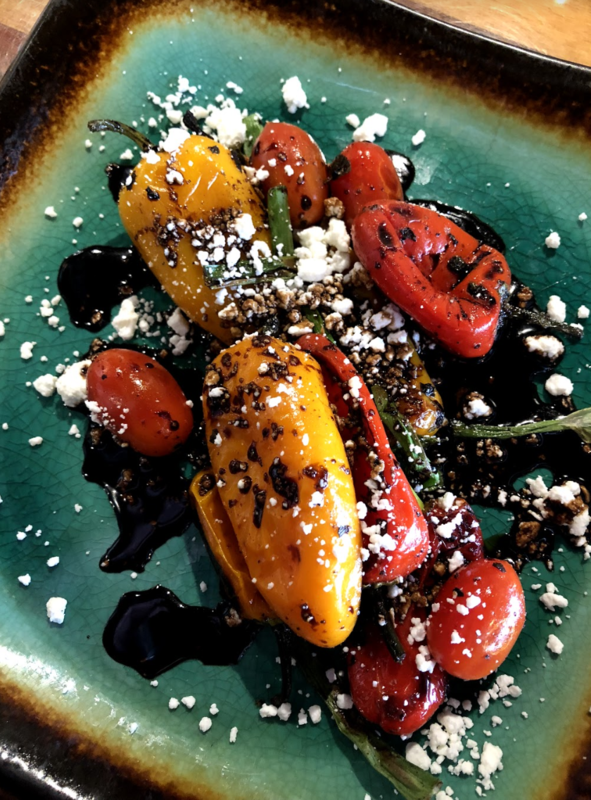 The food is really beautiful, flavorful, and inventive. I believe strongly that no matter your approach to eating or dietary needs, that good food is good food and this is what they serve and offer. Too often do people turn their nose at “healthy” or take it to each end of the extreme – good quality food will nourish you and delight you. Fast-casual concepts like Flower Child, are the wave of the future. 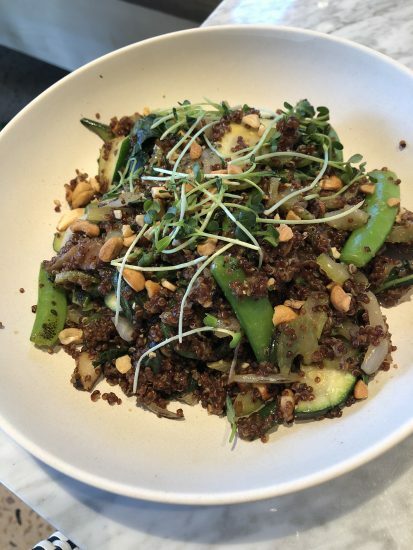 Some of my favorites included the Thai Cashew Quinoa (below) with zucchini, snap pea, celery, onion, shiitake mushroom, jalapeno, thai basil, cashew, and red quinoa (v, and gf). 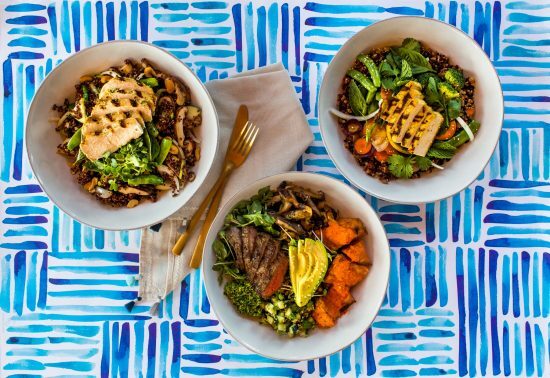 All bowls are $9 unless protein is added. 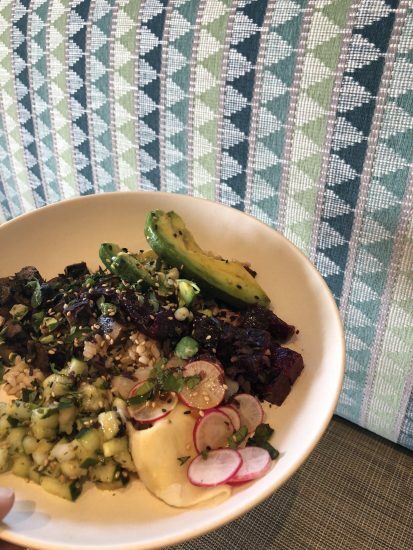 The Vegan Poke which has a variety compelling components really surprised me with its enticing flavor including marinated beets, avocado, pickled mushroom, cucumber, radish, wasabi pea, smoked dulse (seaweed), brown rice, and spicy ponzu (v, gf). I don’t care that it’s on-trend, I love a good toast. 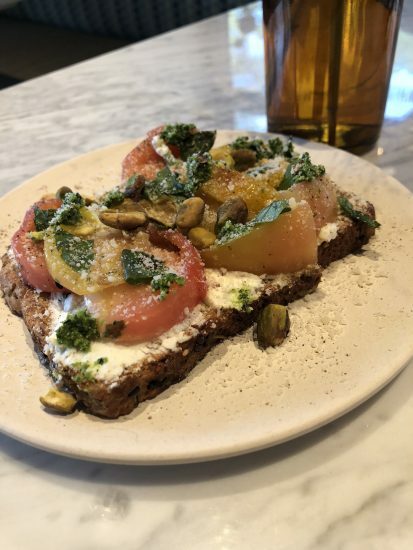 Since I’ve been eating gluten-free I don’t have them as much, and the below mentioned heirloom tomato toast isn’t gluten-free, but it’s beautiful so I wanted to share. It comes with goat cheese, pistachio pesto, and sea salt, cut into a few pieces for a perfect shared appetizer. In the drink department on tap they have Rowdy Mermaid kombucha and organic cold brew. They also offer seasonal lemonades, organic wine, and Colorado beer. Pro tip: Order the dark chocolate pudding for $5 that’s vegan and gluten-free. It’s sprinkled with shaved coconut and made with coconut cream, sprouted almonds, and cocoa powder. You won’t be disappointed. The space in Boulder at 28th and Arapahoe is near Colorado University and has free, easy parking. The restaurant seats 68 and there’s a beautiful patio that seats 28. Inside there are mosaics, decorative tile, plants, and colorful wall paintings to brighten up the vibrant space. They’re open for lunch and dinner from 11 a.m. to 9 p.m.
On opening day on August 22nd, they gave a portion of their proceeds to Boulder Food Rescue. To celebrate further, they’ll host a lemonade stand on Saturday, August 25th from 11 a.m. to 1 p.m. outside of McGuckin Hardware, giving away free lemonade and Flower Child swag. Keep an eye out for them! Finally, we’re offering a giveaway of $50 gift certificate to anyone that lives in Colorado and wants to try their new Boulder location. Follow the link to my Instagram post to enter – like the post AND comment by tagging someone you would love to try their food with. We will pick a winner at random on Monday the 27th. 2580 Arapahoe Avenue, Suite 110. 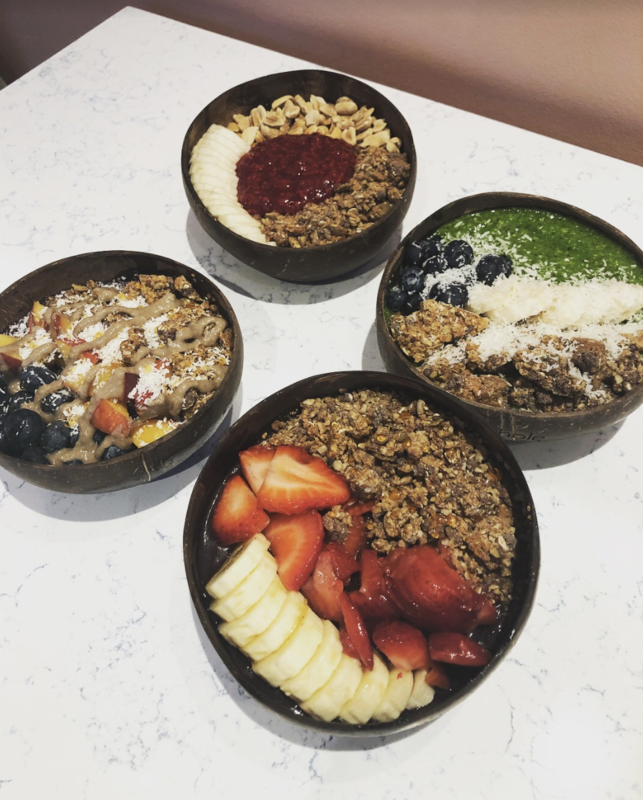 Opened in July in Denver’s Union Station neighborhood by power-couple, Phil Dumontet and Alexa Squillaro, their small, superfoods restaurant serves up inventive smoothie bowls, packed with flavor and nutrition. Their backgrounds are the perfect recipe for bringing forward active nutrition to Colorado. They’re avid marathoners, Alexa has her Masters in Nutrition from Columbia and spent time in New York bringing nutrition to children through the school system, and Phil just sold Dashed, a delivery business, to GrubHub last year (he was also named Forbes’ 30 under 30, a list of the most influential young entrepreneurs). They recently came to Colorado from the East Coast and we’re so happy to have them here! The menu is entirely gluten-free and dairy-free. 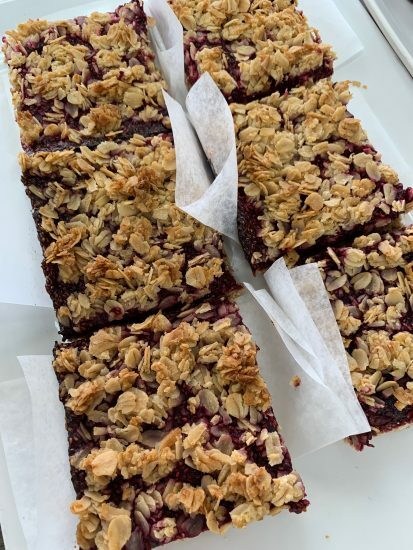 They never add any sugar or fruit juice to their ingredients, and everything is made right in front of you making for a transparent experience. 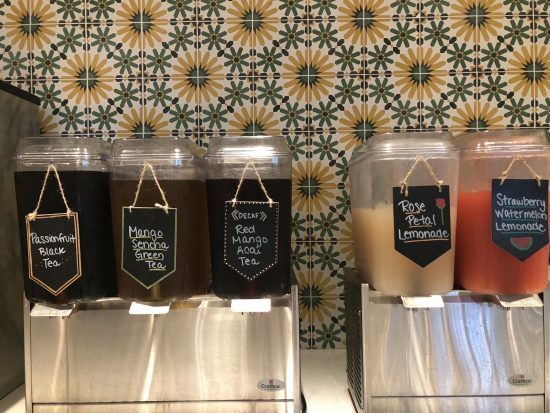 The menu ranges from smoothie bols – served in reusable coconut shells – cold-pressed juice, hot bols that are great for breakfast on-the-go, snacks, and toasts, which is perhaps one of the best avocado toasts I’ve had in Denver. 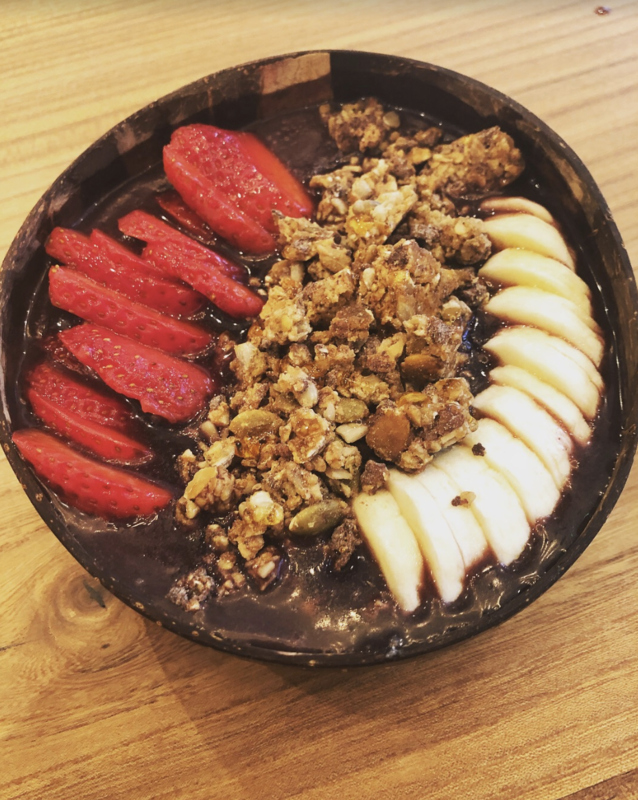 If you’re going the bol route, try the ‘I Like You Matcha’ which has a green base of kale, spinach, banana, pineapple, almond butter, and matcha topped with coconut, banana, blueberries and granola or the ‘The OG’ one of their simplest and most popular, 100% pure, wild-harvested acai base, topped with banana, strawberry, granola, and honey. Unlike other cold-pressed juice places, I find their juices to be inventive. I suggest trying the ‘New OJ’ which is savory, but unlike anything you’ve ever tasted (as Alexa shares when I first tried it). It has bell pepper, sweet potato, orange, black pepper, apple, lemon, and turmeric in it. For something a little different, try their ‘Glacier Water’ a blue concoction made with coconut water, aloe water, spring water, blue spirulina, lemon, and a touch of stevia. The snacks Alexa came up with are perfect on the go, and the kind of thing you should buy in bulk to pop after a workout or maybe mid-afternoon. I love the ‘Matcha Protein Bites’ made with dates, macadamia nuts, matcha, coconut, and plant protein. They also have a chia-seed pudding I recommend, which is made with almond milk. I know it’s everywhere, but I don’t care: I love avocado toast. The best part, I’ve not had a gluten-free avocado toast this good. Anywhere. You must order the ‘White Truffle Avocado’ toast (pictured above). 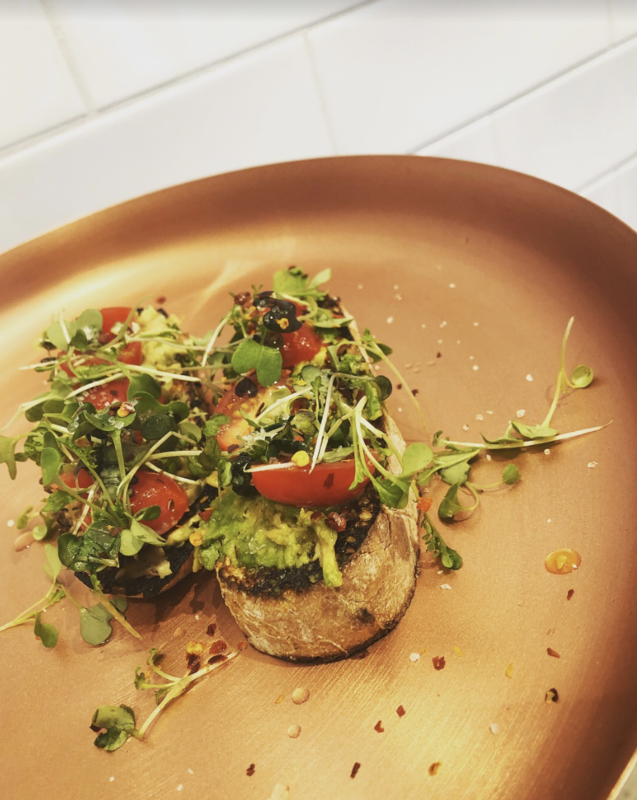 It comes on Kim & Jakes gluten-free peasant loaf, topped with avocado, EVOO, red pepper, microgreens, cherry tomatoes, and the special ingredient of white truffle olive oil. 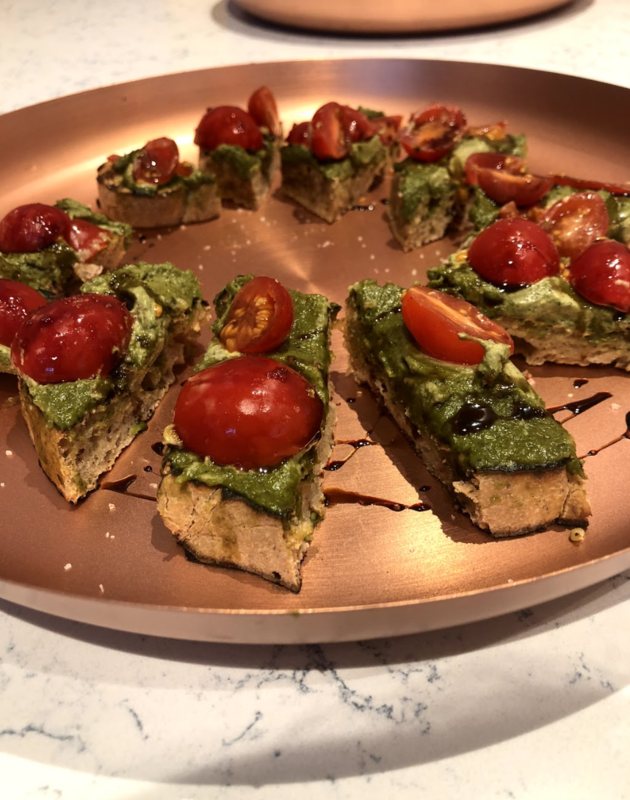 I also found their ‘Bruschetta Pesto’ to be really interesting made out of hemp pesto, treenut cheese, tomato, and balsamic glaze. The cheese-like taste is impressive given it’s dairy-free. 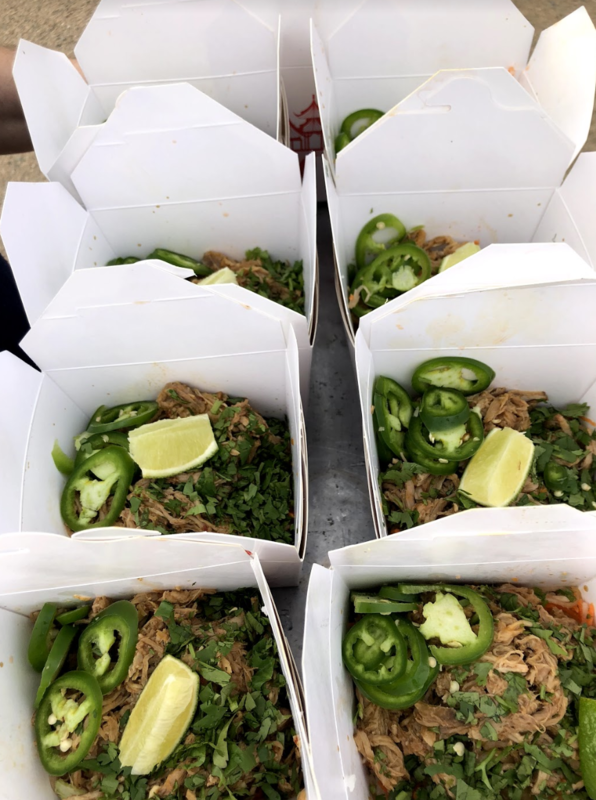 Another impressive component is that all of their utensils, napkins, bowls, and cups are plant based which means they’re all compostable (as is any leftover food you might have on your plate, which I doubt). That means nothing from inside Whole Sol goes to the landfill. Restaurants can do better, and Whole Sol is. What’s next? They plan to open a second Whole Sol location in Boulder, on Pearl Street mall at 1420 Pearl Street. 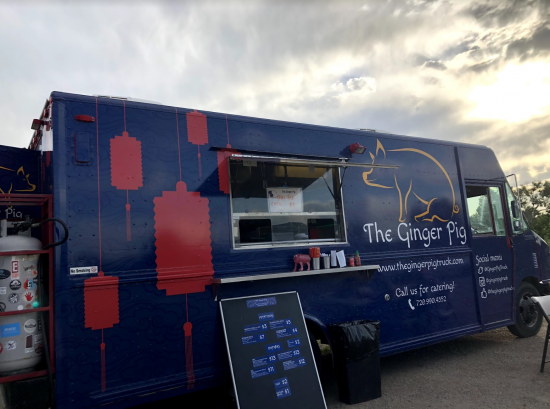 Their Denver location is at 1735 Chestnut Place, and they’re open Monday through Friday from 7 a.m. to 6 p.m. and Saturday and Sunday from 9 a.m. to 5 p.m.
I’ve lived in Longmont since 2015, and prior to that, I was a Boulder girl and lived downtown for six years. Even though I’m in Boulder frequently, I’ve been acclimating to not being in the ‘bubble’. We live in a cute neighborhood, near a great park, walking distance to bars and restaurants, and I’m in awe as I watch the city of 100,000 (yes, basically same size as Boulder) evolve and grow. I have a hunch it’s going to be the Brooklyn to Boulder’s Manhattan – probably needs another 5-10 years but it’s happening. Last I checked there are 11 craft breweries in Longmont (two of which are famed Left Hand and Oskar Blues) there’s also a cidery and a four distilleries. A few other interesting facts – Longmont gets its name from its beautiful Longs Peak that presides over Longmont (great views any which way you look), it was the site of the first JC Penney store, and the first public library was here in the state of Colorado. This is not sponsored by Visit Longmont, but I found this cute video on Longmont I thought I would share that shows the variety and landscape of the town. Shop over 350 different cheese at Cheese Importers: Cheese Importers is a family-owned business that has been open since 1976 by Lyman and Linda White. Now run by their children, the beautiful space offers over 350 types of cheese from around the world, cured meats, specialty oils, spices, olives, chocolate and other specialty foods. In addition to their large cheese “refrigerator” (they even give you coats to walk around to see all the cheese) they also have “Bistrot des Artistes”, a delicious French cafe. People come from around the state to this infamous ‘cheese emporium’. Cheesemaking class with The Art of Cheese: Run by award-winning cheesemaker and dairy goat farmer, Kate Johnson, you can make artisan cheese alongside Kate in her classroom at Haystack Mountain Creamery. If you’re lucky, you may be able to see some of her goats that she raises (and uses their milk for cheese) in North West Longmont. Book a trolley ride to visit all of Longmont’s distilleries and craft breweries with BrewHop Trolley: Available on Saturday and Sunday from Noon to 9 p.m., BrewHop brings you to 13 different locations in Longmont. You can stay as long as you want at each location and on the hour the trolley comes by and you can choose where you go next. You’ll get discounts as a trolley rider at each location, as well. This is so fun for a birthday of group of friends! Farm Dinners: With the growing trend of local and organic, farm dinners are exploding. The cool thing is the majority in the area are actually in Longmont. You can read my farm dinner guide here. Go to one and support a farmer and chef! Longmont Farmers Market: Longmont and Boulder are both run by the same Farmers Market. It’s bustling with people and really quite large. It’s a great way to see a town and support local. Longmont has their farmers market every Saturday, April through November. Union Reservoir: This isn’t far from our house and it’s an 800-acre lake with a beach, campgrounds, and dog beach. You can also rent stand-up paddle boards which is a fun summer activity as you see the mountains in the distance. Great for families. Lagerman Reservoir: Easy access, and great 1.6 mile walk around the water with the mountain vista views. Golden Ponds: This is such a beautiful walking trail system that boasts beautiful views. The park features 94 acres with 56 acres of water surface across these four ponds. It’s almost 3 miles of park trails too. Really beautiful area and easy walking for any level. Honorable Mention: The Boulder County fairgrounds are in Longmont. All year round they have interesting events you can attend from the annual fair, to dog shows, to roller derby, to home shows – there’s a little something for everyone. You never know what you might find and I had no idea it was the county fairgrounds until I moved here. Eat Colorado’s favorite BBQ at Georgia Boys BBQ: Georgia Boys has stood the test of time. Back when I lived in Boulder, I would make the trip to Longmont just for their BBQ that almost always sells out of the good stuff. Now they’re in a bigger location that has plenty of seating and a great bar for hanging out. Try their burnt ends. Oskar Blues – the original craft brew in a can, home of Dale’s Pale Ale: These guys knew what was up with Longmont, long before anyone else. They’ve been around for a long time and not only are their HQ here, but they have many locations. 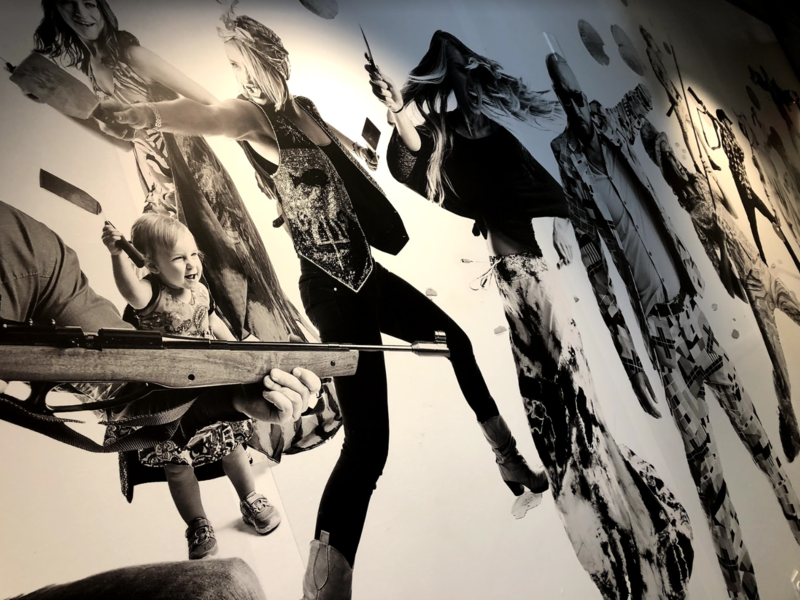 You could do Oskar Blues Liquids and Solids (their main restaurant), Tasty Weasel tap room – best on a weekend afternoon in my opinion, their brewery, CyclHops, their Mexican bike/cantina, or Chub Burger their casual burger joint. The crispy clucker (fried chicken sammy) is one of my favorites at Chub Burger. Support this amazing Colorado company. All their restaurants are delicious. Pubs: Long’s Peak Pub, by Mountain Sun: Thanks to a Boulder tradition we’ve got Mountain Sun within walking distance to our house and it never disappoints. They have a great selection of local beers, delicious pub food, very family friendly, ample outdoor seating, and often live music on the weekends. Pro tip: This location has the best wings I’ve ever had. The other locations (besides Southern Sun) don’t have the wings, so I suggest you order them. I suggest half BBQ, half hot. The Post is owned by a much-loved restaurant group, Big Red F, and they serve fried chicken and great, house-brewed beer. 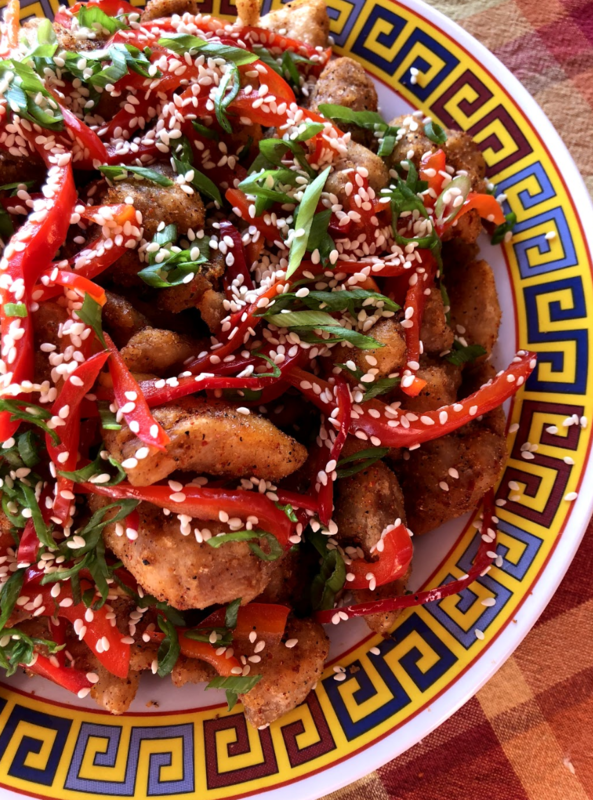 The fried chicken is gluten-free, and Diners Drive-ins and Dives featured them before. Take a look at their weekly specials they have each night – like Monday is $0.75 wings or Friday is a fish fry. Best Pizza: Proto’s (this is the original Proto’s and first location, so it’s really dialed serving Neapolitan style pizza), Rosalee’s Pizzeria (always packed, serving East Coast style pizza, love their garlic knots too), and I need to give a shoutout to Abo’s because they’re a classic and there’s a location in Longmont. They’re who you order for delivery on a Friday night when you’re too tired for anything else. Best Breakfast: Aunt Alice’s a true Longmont, old school diner – you really only see locals and there’s no place really like this in Boulder), Janie’s Cafe (great diner on Main Street, open since 1999. Two Dog Diner located in fun, new Prospect neighborhood of Longmont, this is less of a diner but I love the large breakfast menu and variety of options. Lucile’s Creole Cafe – a Boulder staple, but they have an outpost here too serving Creole cuisine, order the biscuit the size of your head. Note: A Tangerine is opening in Longmont on Main Street in the near future. Breakfast all day, everyday, and a Boulder favorite. 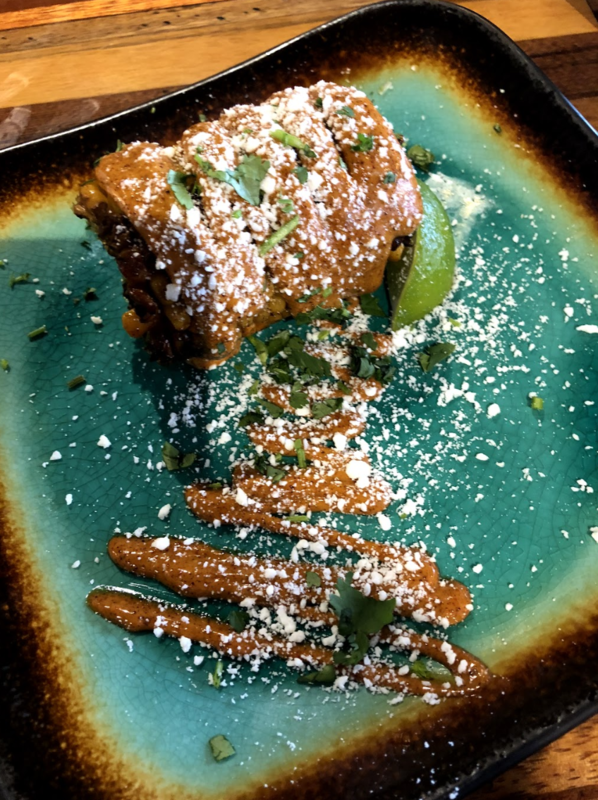 Breakfast Burrito – Taqueria Las Palmeras on Francis Street: There’s really solid Mexican food in Longmont, way more than Boulder could dream to have, but I really love Las Palmeras’ breakfast burritos. These are $2.75, but go to $3.75 after 11 am. Not only is that such a legit price, but they’re a great size and so filling. All breakfast burritos include egg, potato, choice of mild, medium, or hot green chile, and cheese. You can choose plain/vegetarian, pico de gallo, ham, chorizo, bacon or sausage. Mexican / Tacos: My favorites are – Tacos Al Molcajete – family-owned, menu in Spanish, super legit, Jefes Tacos and Tequila –old-school hip-hop plays in the restaurant, lots of tequila, probably a little less traditional tacos, but still fun and best ambiance of all these, Benny’s Tacos – rated by Daily Camera the best taco in Longmont, family-run too right on Main, and Guacamole’s – divey, traditional, you know it’s all about the food as they have no website, great spot – try their Menudo if you dare. Sushi: There’s actually great sushi in Longmont, but my two favorites are Sushi Leo – my #1, Chef Mori San is from Japan and has been making sushi for 40 years! He used to own famed Sushi Tora in Boulder and I also enjoy Sakura. Fine Dining: If you’re looking for a special dinner out I recommend Sugarbeet or Tortugas, a seafood Carribean restaurant. Best Patio: I love Martini’s patio – the restaurant is inside a transformed 1890’s home and you should ask to sit outside. I think they’re really best for the cocktails and small plates (less on the dinner side). The West Side Tavern, a neighborhood gastro pub that has most of their seating outside under twinkling lights and amongst the trees. It’s really cozy. A little different vibe, but the Pumphouse has a patio that is always packed (doggies allowed) and straightforward pub food/sports bar vibe. 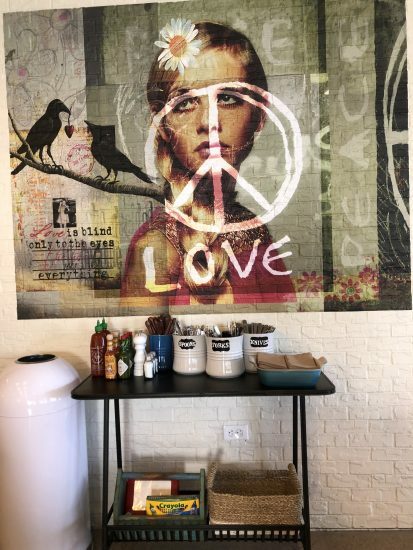 Coffee Shop: There are a plethora of coffee shops in the area, but my favorites are: Luna Cafe in a quaint house on a park, where they bake pastries fresh everyday, have great espresso, many gluten-free and vegan options, and a small selection of used books. It’s a great gathering spot. 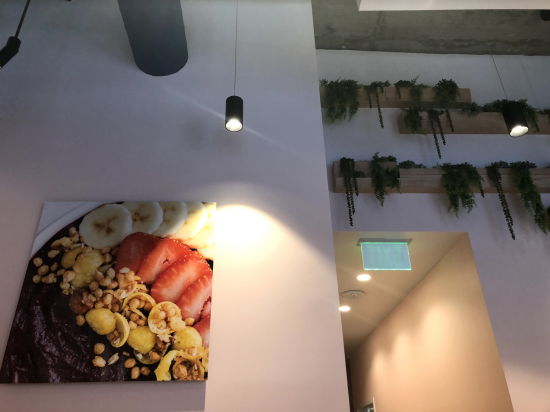 Cavegirl Coffeehouse in Prospect is newly opened in 2018, but they have ample space for meetings (even conference rooms for phone calls/meetings), and Paleo snacks, lunch, and coffee all made in-house, as well. Everything is organic and gluten-free. I name these two for their uniqueness, feeling as if there aren’t other coffeeshops quite like them in town. Favorite Guilty Delivery: Tasty Asia delivers, even on those cold snowy nights, and I just really just like their Chinese food (guilty pleasure for sure). Not all delivery companies are in Longmont, but DoorDash is, so I recommend taking a look there. 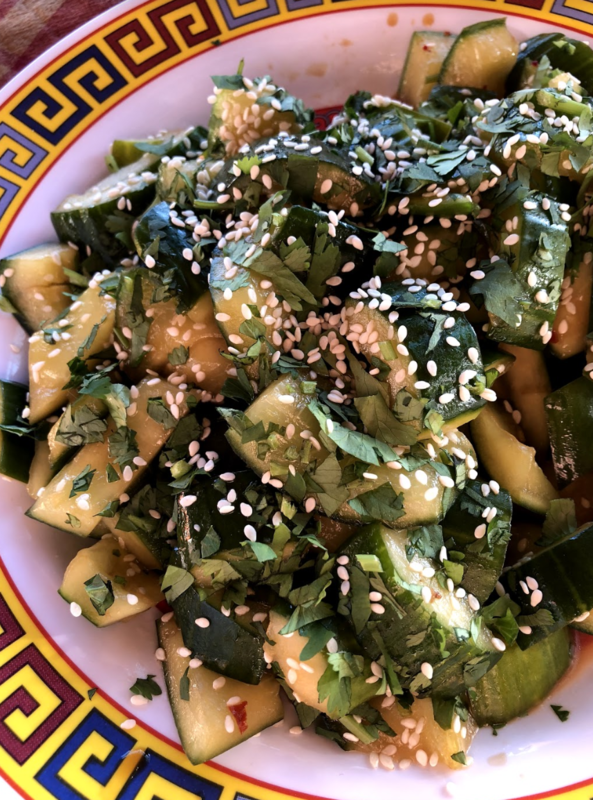 Asian Food: China Gourmet has been in Boulder for years. It’s legitimate Chinese food (look for Chinese only menu) and was cash only in Boulder. They opened another outpost in Longmont, a little off the beaten path, but in a large space in South Longmont. It’s great food and not too heavy. 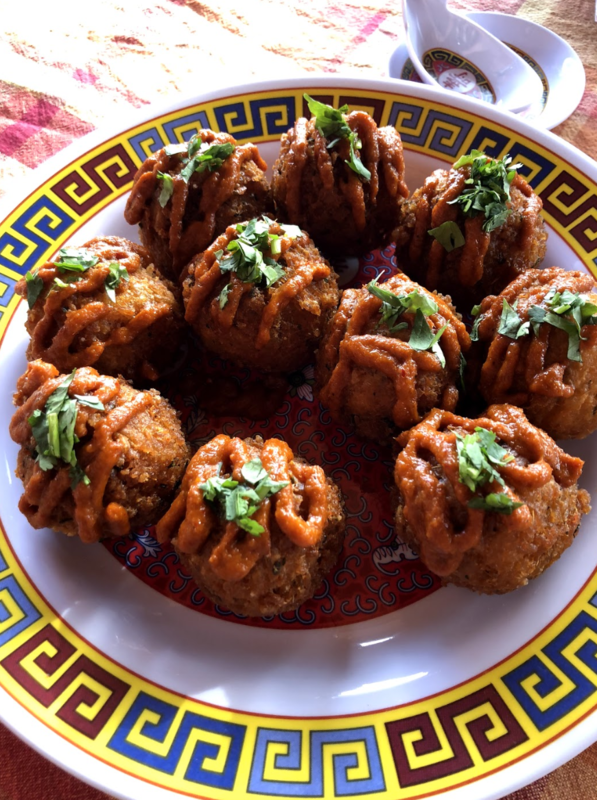 Jai Thai is another favorite offering homemade Thai food. Their avocado curry is a unique item I recommend ordering. Flavor of India has solid Indian food that I’ll often do for pickup on some nights. This list is ever growing. What are your favorites in Longmont? I hope you enjoy!